Unknown to many, the term “wicker” does not actually refer to a specific material used for weaving. It is a generic term used for three different things: 1) the method of weaving cane-like materials, 2) any one of the materials typically used in such weaving, and 3) the end products themselves. The most popular material used for wicker furniture is rattan, a palm that’s perfect for weaving because of its narrow, pliable stems. Other common weaving materials are willow, seagrass, and bamboo. Nowadays, there are also synthetic weave fibers that are highly recommended for use in outdoor furniture. Unlike natural fibers that could rot due to excess moisture or become brittle due to sun exposure, synthetic fibers don’t require much in terms of care and maintenance. In terms of weaving techniques and designs, both natural and synthetic fibers are basically the same. This is why they typically look the same and it’s hard to tell them apart from afar. Small wicker pieces can be constructed completely by weaving. However, larger pieces need to be held up and supported by a much stronger frame. In furniture pieces made of natural fiber, the frames are typically natural as well. Popular materials include the thicker parts of rattan, bamboo, and even wood. For outdoor furniture with synthetic weaves, the typical material used for the framing or structuring is aluminum or stainless steel. Whether natural or synthetic, wicker furniture sets a contemporary yet laid-back feel to any outdoor space. They’re also ideal because they allow for airflow, something you wouldn’t normally get with metal or wooden furniture commonly used outdoors. Article by Wicker Paradise. 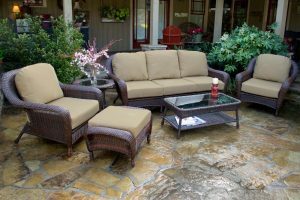 Get everything you need for your patio makeover, from the furniture to the replacement cushions from Wicker Paradise.